To access the Bond Collective Occupie Member Portal, please click the link below and enter your username and password. You should have received an automated email from Occupie with your username and password. If you didn’t receive it or don’t know your username, please reach out to your Bond Collective Community Manager for assistance. Why Are There Two Headers? The blue header at the top is linked to the Bond Collective website. Clicking on any of these links will redirect you to the website and out of Occupie. The red header is your Occupie menu. Each option will direct you to other sections of Occupie. Use the drop down menu to select the location and details about your visit or click directly into the calendar on the desired room. 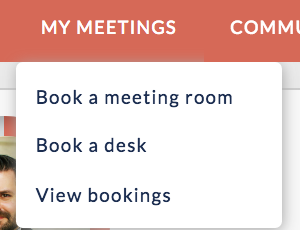 Select time, length of meeting and click ‘Book’. You must click to accept Terms and Conditions before clicking Add to Account, then your Booking Confirmation will appear. What happens if I am over my hours? If you have gone over your hours, there will be a charge instead of showing $0.00 on the screen. You will have to enter credit card details to book the room. If you feel you receive this screen in error, please contact the Bond Collective Community Manager. When this window pops up, select 8 hours for the day pass. Even though there are multiple hours to select, you will always be “billed” 8 hours or a full day with each use. Click to accept the Terms and Conditions and then Add to Account. “You have 20.5 hours remaining.” This lets you know how many hours you/your company have remaining. This is real time so it will update on all bookings relative to the month it is booked. How Do I Add Other Members To My Team? You will be taken to a list of everyone listed under your Account (Company). Click Invite User. Enter User Information and Send Invite. Of note, only Account Admins will be able to invite additional team members to the roster. Reminder: You will need to notify the Community Manager when you add a new member or delete a former to the team to complete the security and facilities access process. How Do I Connect With Other People in the Community? Click on the home page icon for Community or the Community tab on the menu bar to access the Bond Collective network. Click Follow to be updated on their Status and Shout Out updates. Please be sure to fill out your member profile, as well as include a headshot and logo so you can engage with your neighbors. It is important that you complete the fields below for the promotion of your company and skill set to the network. You aren't searchable without completing these fields. Also, if you put which location you are in and which location and floor it can also help neighbors find each other. For example, when you search Food, here is what you get (as of today). Who doesn't love food? You can connect with all of the other people in your community who listed they like food too. *Pro Tip* If I search Graphic Design, which could be useful if you are looking for that skill set to complete a job, only one person comes up...and here's a secret...Tim doesn't know graphic design! So if you don't include the services you offer as part of your business, how would anyone know to contact you for a job? What is a Status & Shout Out? You can let people know what’s on your mind or use Shout Out to ask for advice, post items you are trying to get rid of or just recommend something that crosses your mind. Those who Follow you will be notified of your post. How Do I View Member Perks? Within the 'More Info' tab of the Occupie navigation, select the 'Member Perks' link, and you'll arrive at this screen to navigate to the perks and partnerships portal! From the portal you'll be able to see directly the businesses we align with, and the benefit you're able to receive as a consequence of your membership with us! How Do I View The Events Calendar? Within the 'More Info' tab of the Occupie navigation, select the 'Events' link, and you'll arrive at this screen to view the events coming up that month! Both Google and non-Google users are able to add the events to their calendar for reference. We want to hear from you! Feel free to leave us your comments in the 'Suggestion Box' found under the More Info tab in the Occupie navigation. Via the Occupie dashboard, view any announcements or updates we push out! We'll use this space to notify you of company announcements as well.